The traditional Christmas dish in Guatemala is tamales. Each family has its own distinct recipe and makes them as gifts to share with friends. Well, we were able to convince Angela to celebrate Christmas in February and share with us her family’s recipe. These tamales were out of this world and and whether you celebrate Christmas, Chanukah, Kwanza or Ramadan … these Guatemalan tamales are a wonderful addition to any holiday celebration. They are, rich, satisfying and a taste bonanza. Corn mixture – cook corn and then grind it into a mush. Add salt, olive oil and mix into a paste. If you are feeling lazy, just use cornmeal and add salt and olive oil. 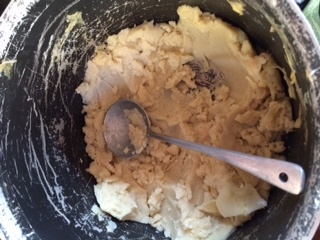 Here is a picture of what the cornmeal mixture looks like before adding additional flavor enhancers. Flavor enhancers – chop raisins, prunes, raw almonds, green olives, roasted red peppers and capers. Mix it all together. Here is a picture of the flavor enhancers. mash them into a paste in a saucepan and add grated cinnamon bark, pumpkin seeds, sesame seeds, chopped prunes, and chopped Pasa & Huaque chilies to taste. Everything needs to be finely chopped and then smashed with a rolling pin against a very hard surface. Seasoning to add to cornmeal mixture. In Guatemala they use pumice stone (think of mortar and pestle). Cook into a sauce for 1 hour in a sauce pan. 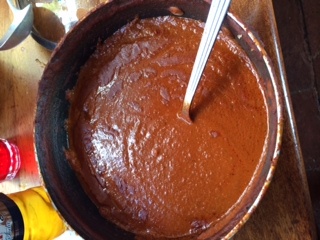 Here is a picture of the sauce once it is completely cooked. The sauce should be the consistency of tomato soup but the flavors are slightly sweet and pungent. Constructing the Tamale – In a doubled up banana leaves place cornmeal mixture, pre-cooked cubed chicken, and salsa. 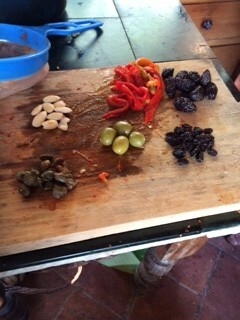 Then place a few raisins, prunes, boiled almonds, roasted red bell pepper slices, green olive with pimento and rinsed capers. Wrap tightly and place in a pot with water. Boil for 2 hours in covered pot. These actually steam, so they need not be totally submerged, just make sure there is enough water to keep the steaming going for the full 2 hours…add more hot water to the pot if absolutely necessary, but better to keep it covered for full 2 hours. Here is a video of how to construct the Tamale. Serve one tamale in a bowl per person. Place extra salsa in a bowl on the table in case you want to add more once the tamale is unwrapped. Eat the tamale off of the banana leaves. WHERE TO GET THE INGREDIENTS: Go to a local ethnic store (Latin American, Caribbean, even some Thai grocers will have these ingredients). You need 2 dozen large banana leaves (feeds 6 people); Pasa and Huaque chilies; and everything else you can get at your local grocery store. Cornmeal – 2 cups; ½ cup each of the flavor enhancers; 2 cups diced cooked (stewed) chicken breasts; 2 dozen big banana leaves. Don’t get spoiled and think that I am going to share all the recipes I have learned in Guatemala with you … oh no, for that you need to go on one of our Epicurean Travel adventures. Did you know that one of the benefits of traveling with us is the recipe book we send you once you have returned home from the Epicurean Travel trip? These recipe books enable you to make the wonderful recipes you learned from our talented cooks. Remember, these recipes come from the very cooks who instruct you during our trips.